The Battle of Turnham Green is the only time the Green Regiment of the Trained Bands was known to have faced action. Following the Battle of Edgehill (23 October), itself probably best considered a draw, and the capture of Banbury, Charles’ army quartered itself briefly in Oxford. The royalist army then proceeded towards London along the Thames, capturing Abingdon, Aylesbury and Maidenhead on the way. An abortive attempt to capture Windsor failed due to the parliamentary strength in the town, delaying the royalist advance on London. This delay allowed Essex with the parliamentary army to reach the city first, on November 8. On the 12 November, a large cavalry detachment lead by Prince Rupert stormed Brentford and proceeded to sack the town. 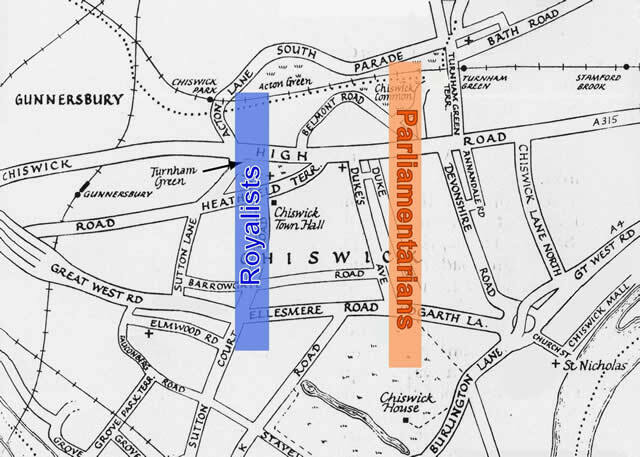 The royalists were victorious but their army was delayed by the parliamentarian resistance in Brentford and halted at nightfall, probably on Turnham Green. The sacking Brentford appears to have galvanised the London merchants to protect their belongings and trade: the Trained Bandsmen were more probably motivated by self-interest than any real parliamentary zeal. On the following day the remains of Essex’s army together with the London Trained Bands and, according to some sources, the apprentices and trade guilds formed a body some 24,000 strong on Chelsea Field. They marched to Turnham Green approaching the Royalist army of about about 12,000 men. …within 2 hours we could descry a great army marching downe upon us from London who came up within musket shot of us. letter from Matthew Smallwood, Kingston upon Thames November 15, 1642, serving with Sir Edward Fitton’s (royalist) regiment. The parliamentarian line extended further than that of the King’s army on the northern side of the field so the royalists deployed musketeers in the hedgerows on that flank to counter the threat. They were driven out by parliamentarian troops, who then outflanked the royalist army on that end of the line with a march towards Acton. Despite this favourable position Essex recalled this detachment when they had marched about a mile, for fear of splitting his army. The battle settled into a stalemate punctuated by exchanges of artillery fire and royalist attempts to provoke the inexperienced Trained Bands to break ranks, but they stood fast. Early in the afternoon, lunch was served to the Trained Bands in face of the by now, starving royalist army. This decisive stroke was to be the turning point of the battle. The City Good-wives, and others, mindful of their Husbands and Friends, sent many Cart-loads of Provisions, and Wines and good things to Turnham-Green, with which the Soldiers were refreshed, and made merry; and the more, when they understood that the King and all his Army were retreated. Bulstrode Whitelocke, John Hampden’s (parliamentary) regiment. Routiers re-enacting the pivotal part of the battle. Photo by Don Brew. The royalist army were short of ammunition and supplies and were too small to force their way through the parliamentarian lines. Watching the parliamentary troops at display-eating was too much for them and in the late afternoon they withdrew. This obliged the king to make a speedy retreat back over the said bridge … He ordered first one half of the horse to march over, next the train of artillery, then the colours wrapt up, without beat of drum. John Belasyse, royalist regimental commander who had led a brigade at Edgehill. [They drew] off their forces and artillery towards Kingston, which they did so fast as they could, leaving only a body of horse to face us between the two Brentfords. Edmund Ludlow, fighting for Parliament. Essex dared not launch an attack in the fading light and so the royalist army retreated unscathed, marching to Hounslow Heath and then Kingston where most of the horse was quartered, and His Majesty stayed the night at Hampton Court. The King being marched away, the General gave Orders for the Citizens to go home, which they gladly observed; to return to their Wives and Families that Night. The King fell back to Oxford and wintered his troops there, Essex did the same in Windsor. The Londoners exprest verye much bountye, courage and confidence in sendinge out Captain Skippon with two regiments of their trained bandes besides three regiments raised in the Cittye and divers troops of horse, and by carefull supplies of ammunition and all other necessaries, espetiallye of victuall, which was a greate incouragement and refreshing to our soldiers. Parliamentary report from Committee of Safety in London. With the military capability of the Trained Bands demonstrated at Turnham Green, Essex had the freedom to campaign away from the capital, secure in the defensive capability he left behind. The royalists never again approached so close to London. The royalist army was commanded by Patrick Ruthven, Earl of Forth, with King Charles I present; Robert Devereux, Third Earl of Essex was the overall commander of the parliamentarian field army with Sergeant Major General Philip Skippon in command of the London militia. Roberts, K, London & Liberty, Partizan Press, 1987. Royle, T, The British Civil War: The Wars of the Three Kingdoms, 1638–1660. New York: Palgrave MacMillan, 2004.